Brad Trencamp's American Can factory from Baltimore. A wonderful model. We just wrapped the MARPM 2018. The event was a great success. The volunteers and I had a great time hosting it at the BWI Double Tree Hilton Inn, near Baltimore Maryland. About 150 people attended the event. Jack Keane's O Scale D&H layout. The layout is about 30 percent complete. It started out with operating sessions and open houses on Thursday. Hal Miller and I visited Jack Keane's O Scale empire and Don Marvel's freelanced HO Appalachian railroad. Jack's layout has one level of three planned levels complete. It will be a monster layout when finished. Don's HO layout is nearly finished and is beautiful. There were other layouts open, such as David Vaughn and Lance Mindeheim, that I did not get to visit this time. On Friday and Saturday we had a steady stream of clinics from 0800 to 2100 with only a hour and quarter break for dinner, that's right - no lunch break. You had to eat on the fly if you didn't want to miss anything. 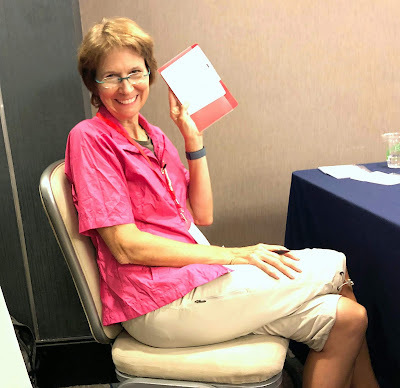 The list of clinic presenters read like who's who of model railroading, and all were excellent public speakers too. It will be hard to top this group, but we can try. In addition to the presentations, we had hands on clinics for passenger car building and weathering techniques through out the weekend. The sales area had 27 tables of model railroad goodies from 10 different vendors. Hopefully our vendors did well. Several said they would consider coming back. We held a raffle during the meet and it was a big success. There were lots of prizes for the lucky winners, all donated by our generous sponsors. Shannon Crabtree posted a set of photos to his pbase website. You can find it here. On Sunday we had several layouts open for visits. I had 8 visitors, Ken Montero, John Drye, Tom Pierpoint, Michael Spoor, Ben Hom, Mat Thompson, Gary Boardley and John Stralka stop by. I put them to work running trains on PoLA and Aquia Line. Alicia made brownies and coffee for snacks. The venue received nice comments from the attendees. We are looking into using that same venue for next year's meet. We need to sort out possible dates and other details before we can announce a MARPM 2019. A big shout out of thanks to all that attended and supported the event. If you want to attend next year there are three ways you can support the event. Guest operators work PoLA during my open house. The south east coast of the United States is bracing for a large hurricane, named Florence. While we don't get too many hurricanes in our area, there have been some devastating storms in the past. Hurricane Camille in particular caused a lot of damage in Virginia. As I looked at the expected landfall of the current storm, right into the Carolinas, I was wondering what would have happened if a major hurricane hit land during the Civil War. Wikipedia has a list of recorded hurricanes for the most of the united States history. The records are spotty, but the bottom line is that during the ACW, just a few hurricanes made landfall and they had minor effects. 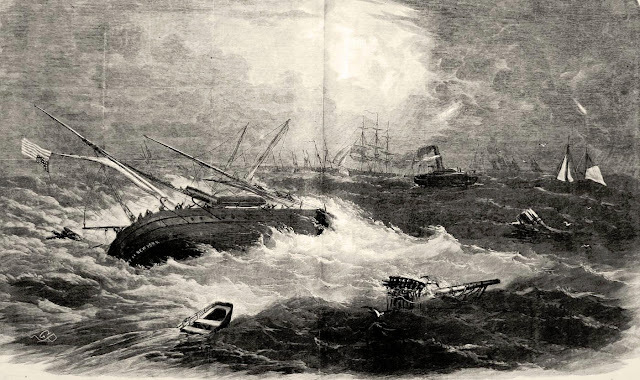 This blog post by Brian Whitenton at the Mariner's Museum summarizes the effect of a storm on the Port Royal expedition. Another good summary of hurricanes during the ACW, and earthquakes too, is at this blog. I will heading north this weekend, away from Hurricane Florence. I will be at the NMRA NER Regional Convention in New Jersey. I will be presenting two clinics and the key note talk. I look forward to seeing my northern friends. I will return next week, to help host the Middle Atlantic Railroad Prototype Meet 2018. We have a great event lined up. Please see www.MARPM.org for info. The Thursday op session is full, but some openings are available for the Sunday op sessions. If you wish to attend the Thursday open houses you must preregister for the event. We have a bunch of vendors signed up with 27 vendor tables, making this a great opportunity to pick up supplies for the up coming model railroad season. Our top ranked clinicians are ready to present a carefully curated list of topics that will capture your interest. Registration will also be available at the door with payment by check, cash or credit card. Please stay safe during this up coming storm and we'll see you next week. 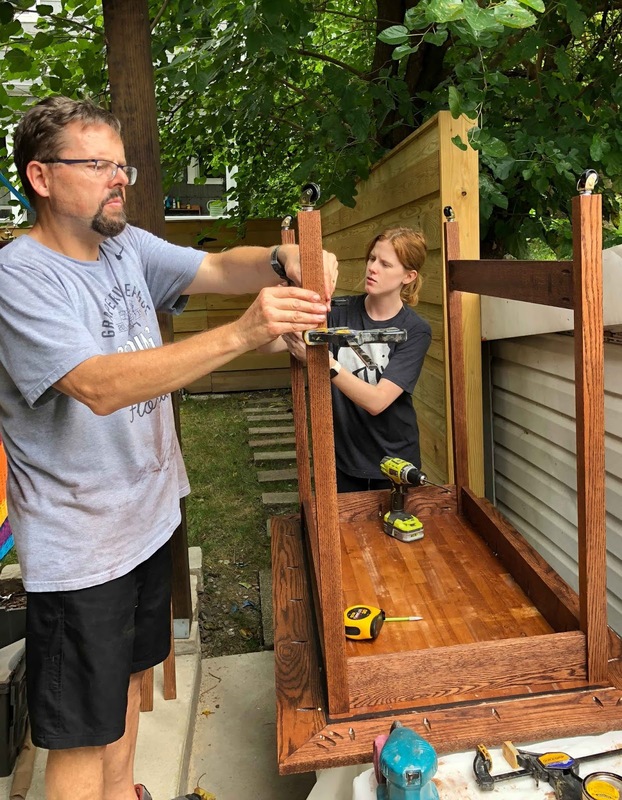 We just got back from a trip to Pittsburgh, PA to help my daughter with some household projects. She and her husband just moved there. They purchased a house in an older neighborhood that is undergoing urban renewal. Her house has been thoroughly renovated and is quite charming. The rebuilders added a modern bathroom to the first level, as the house previously only had a small full bath in an other wise unfinished basement. Turns out this is a quirk of many Pittsburgh homes, called a Pittsburgh Potty. old molding strips are on the floor. There are two theories about why this was a popular design. One was sewer problems were common in the older cities, so a bath in the basement limited damage from a sewer back up to just the lower floor. And, my daughter and son-in-law did have a sewer problem as soon as they moved in that required demolition of part of the basement floor. The second theory is that mill workers could change their dirty clothes and wash up in the basement before coming up stairs into the rest of the house. Alas, there are almost no mill workers left in Pittsburgh. Either way it is an odd quirk and part of the charm of Pittsburgh homes. The basement is clean and dry, though relatively unfinished, just painted walls and joists. A nice layout could be built in it. However, they are not interested in a layout. Instead we built a kitchen table. The table was originally a thrift store coffee table that she and I customized with a new top and trim when she lived in Denver. 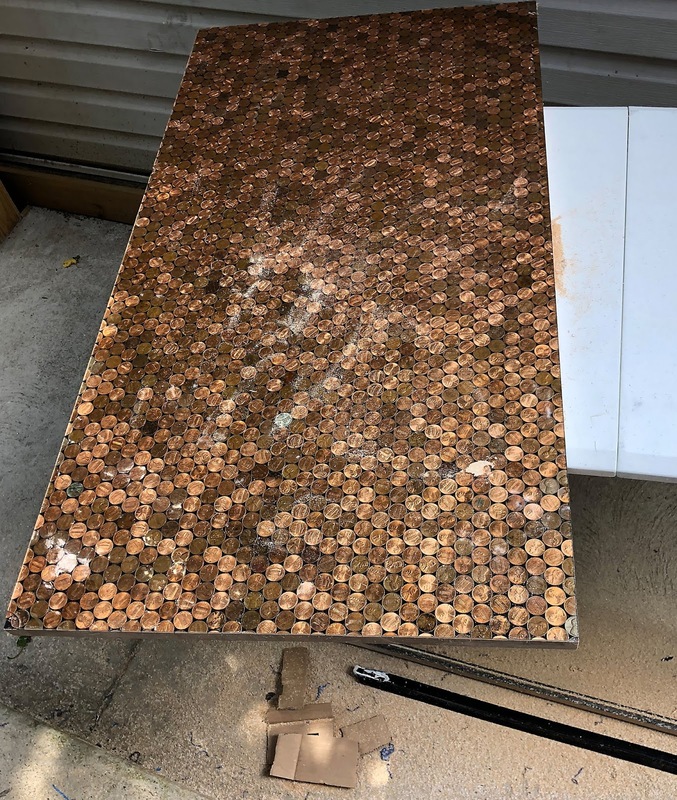 The top has a layer of pennies secured in place with casting resin. 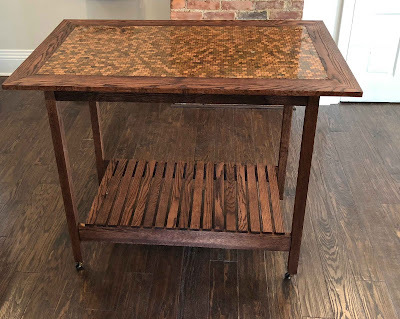 She wanted to repurpose the top into a kitchen table. Disassembling the legs of the coffee table was fairly easy, but the trim on the top was not coming off. We had used a piece of PVC molding for the trim and it was securely attached to the resin. 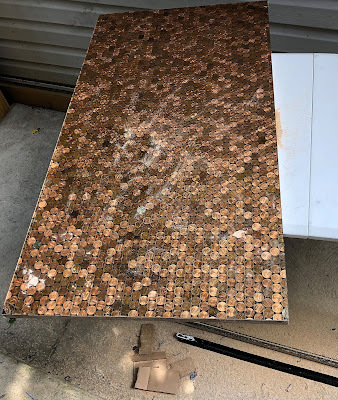 After some cogitation, we decided the only solution was to use a circular saw to cut through the table top, the pennies and resin. That worked pretty well as the saw cut right through. But to our surprise, the resin pulled away from the table surface in a few places and chipped in two others. In addition, some pennies popped loose. We had used CAA to glue them. I never would have expected that. Now that we had a nice clean edge on the table top it was a relatively simple matter to add a mitered wood frame around the top. We used 1x4 oak, so the table became 7 inches wider and longer, which pleased the owners. Building the legs and shelf underneath was very similar to building model railroad bench work, so the job went well. 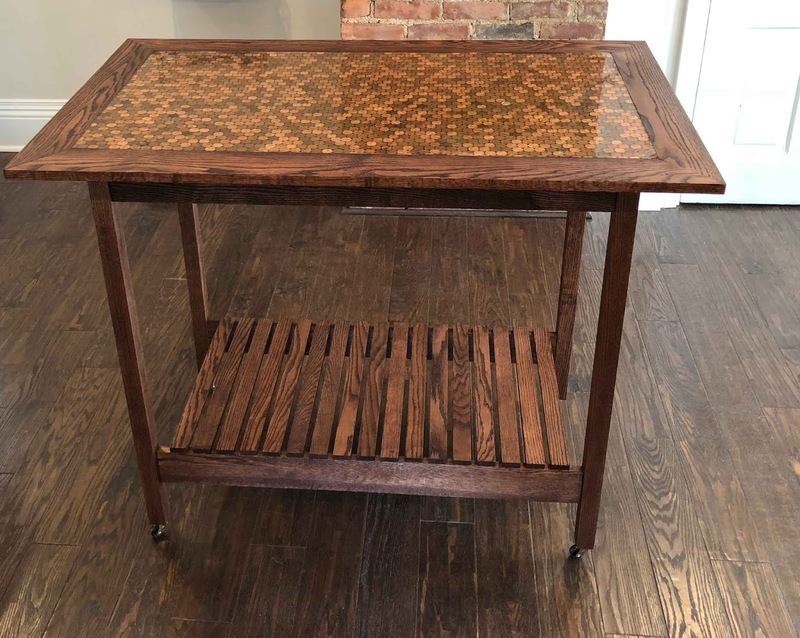 The finished table is above. While in Pittsburgh, we had a chance to visit Neal Schorr's O scale layout. He uses 3-rail track and equipment, but designed the layout is an otherwise scale manner. It's a hybrid approach 3-rail trains in a prototypical design. For example, his Duncannon Bridge scene is closely based on the prototype. He has many detailed realistic structures, and an impressive backdrop. The layout is essentially a large folded loop built like a shelf layout. There are a few deep scenes to add realism too. Neal cites the reliability of 3-rail equipment as the rational for the layout. He once had an extensive HO layout, so he has a good basis for comparison. But lets face it, big O scale trains are cool. The massive appearance, impressive sound, and even smoke that looks almost realistic, all add to the charm. Check out video at the bottom for an example.